Neena Gopal wanted to know whether the Kashmir issue is a mess of our own creation as Pakistan is having free ride doing what it wants. Dulat, who has written two books, “Kashmir: The Vajpayee Years” and “The Spy Chronicles” with Pakistan ISI’s Lt. General Asad Durrani was categorical in stating that the muscular policy from the start by the government in power is never going to succeed. “No serious insurgency has ever been contained by force and there is a book dealing with insurgency way back in 1951 which has been talking about this. The only way peace can be brought in Kashmir is by winning the minds of the people there,” he said. He pointed out that every top leader who talks about Kashmir in a way that does not suit the powers-that-be is either anti-national or pro-Pakistani. Delhi hates Kashmiris. “It was the late Prime Minister Atal Bihari Vajpayee who through his humanistic, Insaniyat, Jamuriat and Kashmiriat approach was able to keep the conflict in control,” he said. Then Neena asked about his stint as the R&AW chief and Anand Arni replied the difference he (Dulat) made to the office especially coming from IB (Intelligence Bureau) after spending 30 years there. On the IC 814 hijacking, Dulat revealed how furious the then Chief Minister Farooq Abdullah was when he was asked to release the terrorists lodged in Kashmir jail and said, “And then he angrily said: You again? Tumne Mufti ki beti ke liye kiyatha, phir wohi karrahe ho” and how finally Abdullah himself drove in a jeep along with him (Dulat) to meet the Governor to offer his resignation but then how the smart, suave Governor Girish Chandra ‘Gary’ Saxena, incidentally, a former R&AW chief, dealt with the situation so extremely well. ‘Doctor Saheb, come-come, sit down, relax,’ Gary said. ‘You’re a fighter, you don’t give in so easily.’ Out came the bottle of Black Label. As he poured the Scotch, Gary said: ‘Doctor Saheb, you can’t throw in the towel so easily. Sit down, relax.’ Then Dulat spoke about how Abdullah agreed to release the terrorists and thus the lives of people in the aircraft in Kandahaar was saved. To another question on the assassination of Rajiv Gandhi and whether it was the LTTE which had done it or whether it were the same people who had blown off Zia ul Haq, the Pak President, he said anything is possible but the idea is far-fetched. The discussion veered towards General Pervez Musharraf and Dulat said how the former Pakistan President was always reasonable, who had said that whatever is acceptable to the Kashmiris is acceptable to him when he (Musharraf) speaks about his four-point formula. However, former Prime Minister Dr. Manmohan Singh did not support him for his own compelling reasons, said Dulat. Dr. Sudha, Kanti Joshi and Dr. Prithvi Datta Chandra Shobhi. 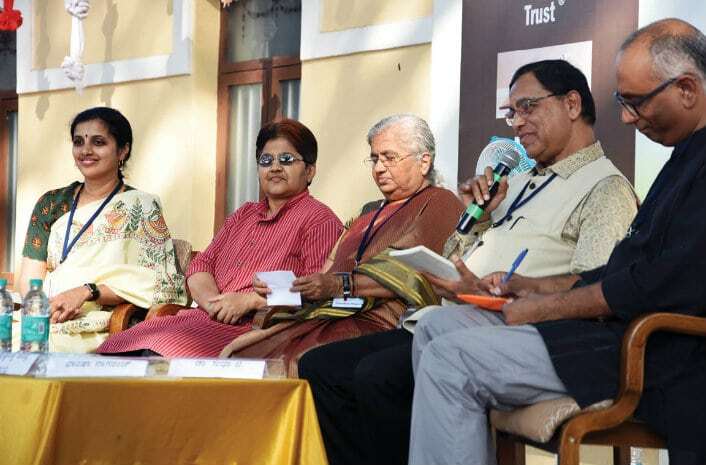 Earlier to this at Thangaali was a session in Kannada on the most discussed topic of the day about sexual harassment and the way women are targeted — ‘Nirbhaya Samaja: Yaara Javabdhari?’ Here the panellists included Shantha Nagaraj, a Counsellor, Dr. Sudha, a College Professor, Kanti Joshi, an advocate who is involved in SASHA (Support Against Sexual Harassment) and Dr. Prithvi Datta Chandra Shobhi, an expert in Cultural Studies at KSOU. The question that was raised was who is responsible for keeping the society fearless and each panellist gave a perspective on the role of family, the society, the law and the role of men in a misogynist society. Finally, the conversation veered to MeToo Movement when Moderator Prof. C. Naganna, former Prasaranga Director, asked whether the present day’s women empowerment had made them bold to come out with stories of sexual harassment they were subjected to in their lives by men. The panellists agreed that this could be one of the reasons for women to come out in open as they felt there was strength in numbers to vocally express their views. 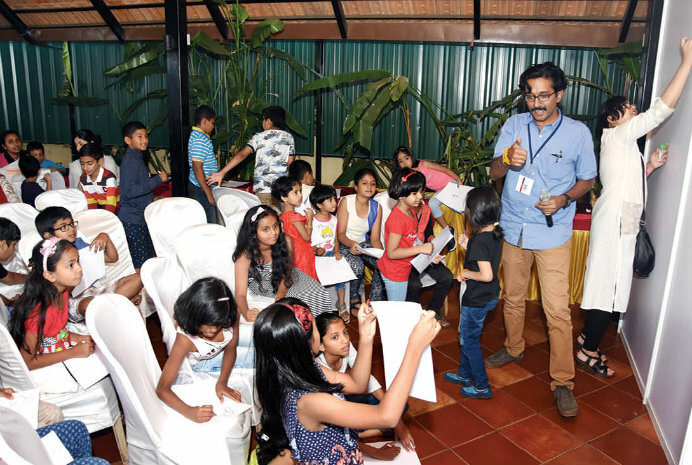 There were nearly 150 children listening to stories by Vani Venkatram on ‘Ondanondu Kaaladalli-Ajjiya Kathegalu,’ Chaitali Verma and Trupti Srikanth from Bengaluru telling stories ‘Fasten your seat belts’ and ‘Majaa Stories-Get ready for some serious fun’ had the children wanting more. The finale in this Putaani Prapancha section was Hissss…Tales by Snake Shyam, who did a video presentation though the children expected him as usual to carry live snakes. Chaitali Verma and Trupti Srikanth from Bengaluru narrating stories to children. The day-long festival ended with Police Band playing some lilting tunes and also fast ones. “The Mysuru Literature Festival is different from other literature festivals in the country simply because it is purely a local festival organised by the Mysureans and that too women members of the Mysuru Book Clubs 2015, who are totally involved. 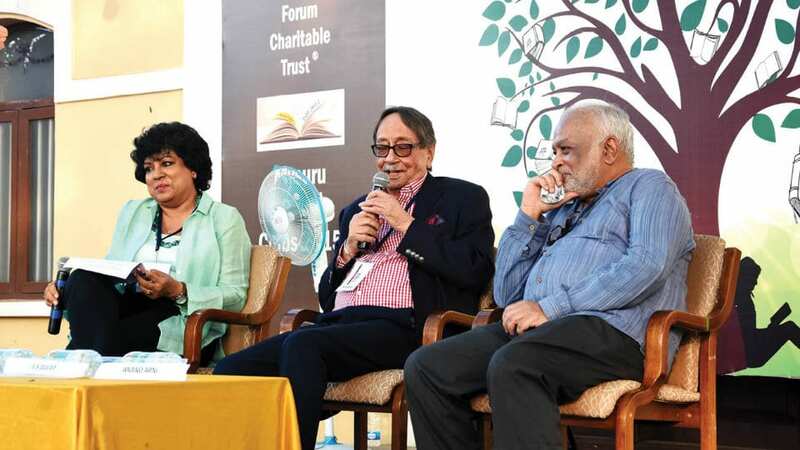 I strongly feel that it should retain its pristine flavour and purity,” said author Prof. Chandan Gowda of Azim Premji University, who was one of the panellists and who is also one of the juries for selecting books at the Hindu Literature Festival. Snake Shyam being introduced by Mysuru Book Clubs 2015 Member Deepika Rao. This sentiment was expressed by all the 40 authors and experts who attended the Literature Festival as also the audience who were able to pick and choose the genre of their choice both in Kannada and English even as the organisers led by the effervescent and efficient Shubha Sanjay Urs coordinated the day-long festival with great élan.